Election debates. Leadership interviews. Question Time Special. Party Election Broadcasts. It won't have escaped your notice that (in the UK) there's a General Election happening next week. The political spectrum is much more fragmented these days and the parties are undoubtedly planning for coalition deals and agreements - even if they publicly deny this. 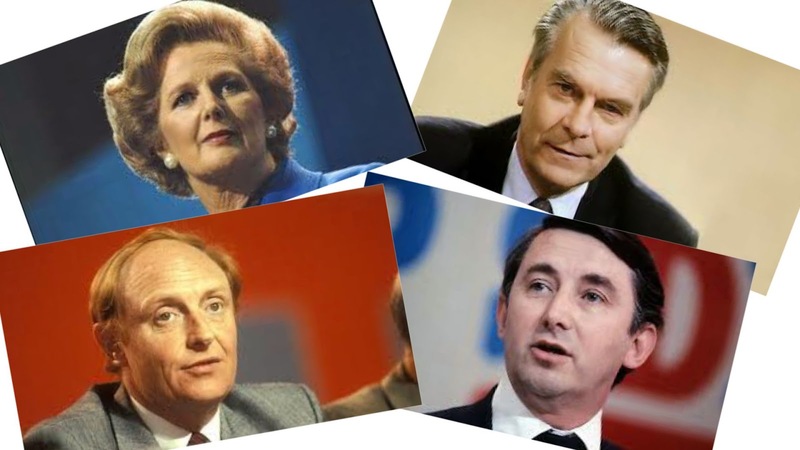 Cast your mind back to the mid-80s, at the height of Thatcherite Britain, and it was still a two-party system. But thoughts of a possible coalition government were on the minds of the Liberals and the (now defunct) Social Democrats who had formed the SDP-Liberal Alliance. These four interviews feature the main party leaders (for the majority of the decade). Three come from a series of conversations with Michael Charlton, best known for Panorama, that were broadcast on BBC Radio 3 at a time when the station still carried current affairs amongst the classical music and drama (see Six Continents). And finally from an edition of The World this Weekend on 31 May 1987 is PM Margaret Thatcher talking to Gordon Clough.